After its premiere at the Hong Kong ArtWalk Extra this spring and the ART STAYS International Festival of Contemporary Art in Slovenia this summer, the international video project Translation(s) curated by Laurence Wood and Zoran Poposki will be screened in the programme of the 5th edition of NotFestival in Copenhagen, Denmark, from from September 16-21, 2013, at The Danish National School of Performing Arts (Statens Scenekunstskole). 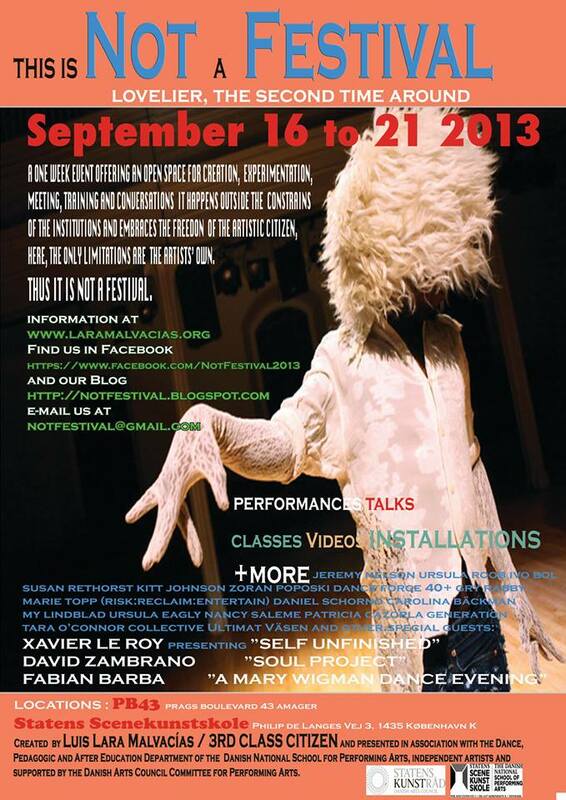 "The Not Festival is a kaleidoscopic, ephemeral, erratic and nomadic artistic object. It embraces the ideas of global artistic collaboration and the cross-cultural, interdisciplinary, DIY attitudes.Through the use of old and new artistic approaches, technologies and media it exists outside the realm of the establishment, which implies generally non-existing financial support. However, its inclusive nature allows it to move inside and outside of institutions and at the same time avoid the institutional restrictions. This political “object” aims to fight the standardized and systematized commodification of the arts. Thus, it is NOT a FESTIVAL." Featuring works by Arnold J. Kemp, Tricia Sellmer, Lucy Harrison, Daniel Arnaldo-Roman, Zoran Poposki, Laurence Wood, Luis Lara Malvacias, Tessie Word and Damon Ayers, Victoria Hindley, and Eva Petric, Translation(s) consider the centerless chronotope of global negotiation and interchange between agents from different cultures as an emerging network of new pathways of translation between multiple formats of expression and communication. Through a variety of approaches to video, the artists featured in this project explore the dynamic interplay between the global and the local on a concrete, material level. The Danish National School of Performing Arts (Statens Scenekunstskole) is the main educational institution in Denmark within the fields of acting, dance, choreography, scenography, light and sound design, musical accompaniment for dance, dance partnership, production and stage management and props design. Simultaneously with the Copenhagen festival, Translation(s) will also be on show at the Chazou Gallery in Kamloops, BC, Canada, from September 18 to October 18, 2013.